Medicare Part D was created by the Medicare Prescription Drug Improvement and Modernization Act of 2003 (MMA) to provide affordable prescription drug insurance coverage with a variety of benefit levels and premium costs. Over the past ten years, Part D has developed a track record of competition among plans for seniors’ business, controlled premium and budget costs, and excellent access and quality. Medicare Part D has matured into a financially successful and popular program. However, regulations proposed by the Centers for Medicare and Medicaid Services (CMS) in January 2014 will mean that an estimated 14 million seniors could lose their current plan, beneficiaries could see premium increases of up to 21 percent, and the changes could cost the Part D program up to $10 billion over the next ten years. This paper details the current success of the program and the likely impact of the fundamental restructuring hidden within the new CMS regulation. Part D was created to fill a gap in the health care financing system for seniors: insurance against the costs of outpatient prescription drugs. When the Medicare program was signed into law in 1965, prescription drugs were not a prevalent part of health care and long-term pharmaceutical use was less common than other treatments. Part D addressed the need to update Medicare to reflect the changes in the practice of medicine. Part D is built on competition among private insurance plans. Though plans face a minimum benefit requirement, much of the cost sharing, additional benefits packages, and pricing structure is left to the prescription drug plans (PDPs) for development. Because plans have a high level of flexibility in the ways they structure their programs, a large number of plans exist, containing a variety of premiums and benefits. This structure was the first of its kind in entitlement programs, and at the onset of the program, there was concern surrounding plan participation. However, Part D has proven to be an efficient part of the Medicare program, coming in well under budget projections and the benefit continues to be innovative and affordable. Over the past ten years, Part D has continually performed better than projected in federal budget costs. Estimated costs for 2012 decreased from $122.88 billion to $65.1 billion over the 2004-2011 timespan, and actual costs for 2012 came in even lower, at $55 billion. Along with the decrease in costs at the federal level, beneficiaries have reported high levels of satisfaction with the program, with 17 percent extremely satisfied and 42 percent very satisfied with the program; signaling the availability of affordable, quality coverage. Competitive Bidding – Through an annual bidding process, Medicare calls for bids for the 34 geographic regions across the country. Plan sponsors select the regions for which they would like to provide a per member per month (PMPM) plan cost or “bid” that contains a rate for coverage of standard required benefits, and designates the cost of any additional services – plan bells and whistles. CMS then announces the calculated national average monthly bid, which designates the dollar amount of contribution (74.5 percent for Medicare/federal share) for the program. Plan Selection – Medicare beneficiaries choose from the available plans in their region based on costs and benefits offered. Since Medicare pays 74.5 percent of the national average monthly bid for every enrollee, Medicare beneficiaries pay the difference of their plan amount. Beneficiaries may choose low cost plans to save money, or they may choose a plan that, at higher premium, provides additional benefits, or contracts with local, convenient pharmacies as a part of their preferred provider network. Preferred provider networks offer discounted copayment rates to beneficiaries for using providers within the network. Enrollees review and re-assess their Part D plans every year during an open enrollment period, where they can change programs or renew their current plan. In 2013, beneficiaries were able to choose from at least 23 different plans in each of the Part D regions. Part D is designed to encourage plan competition and increases the incentive to offer lower premiums and attract additional enrollment. Each year, the interaction between plans and enrollees encourages market competition, a variety of plans to choose from, and low monthly premiums. The new proposed regulations, entitled Medicare Program: Contract Year 2015 Policy and Technical Changes to Medicare Advantage and Medicare Part D, alter the current structure of the program and thus jeopardize its success and quality. The proposed rule could result in increased premium and copayment costs, decreased continuity of care for beneficiaries as well as fewer participating pharmacies. Interpreting the statutory non-interference clause. For the first time, CMS has interpreted statutory non-interference in the Part D program. Through this proposed regulation, CMS’ interpretation allows for federal interference in negotiations between Part D plans and provider pharmacies. Interfering in plan negotiations places the issuers at decreased risk, reducing their incentive to control plan costs and limits plan innovation in cost sharing and benefit packages. Limiting the number of bids per PDP Issuer. The regulation adds requirements limiting the number of plans that can be offered in one of the given 34 regions. All issuers are limited to offering one plan that only contains the standard benefits and another plan that offers enhanced benefits. Limiting the number of plans per firm to two restricts beneficiary options which will inevitably increase the costs in all regions. Creating uncertainty for 2015. Finally, the new Part D regulation impacts insurance plan markets by creating uncertainty and instability in the 2015 plan year. In order to protect their organizations, issuers will provide fewer options for beneficiaries at higher rates due to the plans’ inabilities to predict costs in the 2015 market. Any willing provider. The proposed “any willing provider” provision means plans would be required to accept any provider into their network that is willing to meet the terms and conditions of the plan’s contract. The addition of the any willing provider requirement could cause over fourteen million seniors to lose their current plan within a preferred provider network, disrupting the continuity, quality of coverage, and increasing costs through the removal of discounted membership rates. Preferred provider networks have proven to be a mechanism through which Part D has been able to achieve great cost savings. As reported in a study by Milliman, the continuation of preferred provider networks would save the federal government an estimated $9.3 billion over the next ten years. Crowd out of employer insurance. The regulation creates incentives for employers to get rid of their employer sponsored retiree pharmaceutical benefit, in exchange for sending their retirees to the Medicare Part D program for coverage, increasing costs for the program. The proposed regulations will likely increase costs for seniors and the federal government. Interference in plan-provider negotiation inhibits innovation, limiting the number of plans that can be provided in a region decreases competition – in turn driving up costs. Part D is a program that came in under cost projections over the last ten years, provided affordable coverage for seniors, and continues to encourage lower costs of prescription drug plans. The implementation of these regulations would negatively impact the market-based design and the popularity of the Part D program. Book, Robert A. Ph.D., Holtz-Eakin, Douglas, Ph.D., Competition in the Medicare Part D Program. September 2013. Based on estimated ten-year savings from preferred pharmacy networks as reported by Kaczmarek, Stephen J., Sheldon, Andrea, Liner David M., “The Impact of Preferred Pharmacy Networks on Federal Medicare Part D Costs,” 2014-2023. Milliman, October 2013. Kuttner, Hanns. Introductory Essay in Hanns Kuttner and Tevi Troy, eds., The Medicare Drug Benefit Five Years Later: Is it working? Hudson Institute, December 2011. Terence Kealey, The Economic Laws of Scientific Research, St. Martin's, 1996, gives the example of histamine-2 blockers replacing surgery for the treatment of gastric ulcers, pp. 226-228. This is just one example of a larger trend. One more recent example is that of infliximab (Remicade), which reduces the percentage of ulcerative colitis patients requiring a colectomy from 17 percent to 10 percent. Sandborn, W.J. et al., “Colectomy Rate Comparison After Treatment of Ulcerative Colitis With Placebo or Inﬂiximab” Gastroenterology, 2009; 137: 1250 –1260. Kuttner, op. cit., p. 7, citing Trustees' Reports from various years. Kuttner, op. cit., citing KRC Research, “Seniors' Opinions About Medicare Rx: Sixth Year Update,” October 2011. MedPAC, “Part D Payment System,” Payment Basics, revised Oct. 2012. Medicare Payment Advisory Commission, “Report to the Congress: Medicare Payment Policy,” Chapter 15, March 2013, p. 344. Medicare Program: Contract Year 2015 Policy and Technical Changes to Medicare Advantage and Medicare Part D, CMS-4159-P § III (2014). Congressional Budget Office. Letter to Congress. Re: Removal of the Non-Interference Clause. January 2004. Medicare Program: Contract Year 2015 Policy and Technical Changes to Medicare Advantage and Medicare Part D, CMS-4159-P § III, 79 FR 1962, (2014). 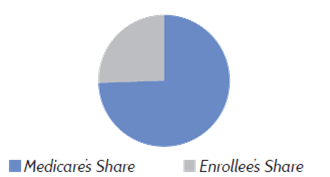 Based on 2014 enrollment in Medicare Part D prescription drug plans with preferred pharmacy networks as reported by the Drug Channels Institute. http://www.drugchannels.net/2014/01/for-2014-3-out-of-4-seniors-choose.html and estimated ten-year savings from preferred pharmacy networks as reported by Kaczmarek, Stephen J., Sheldon, Andrea, Liner David M., “The Impact of Preferred Pharmacy Networks on Federal Medicare Part D Costs,” 2014-2023. Milliman Report, October 2013. Kaczmarek, Stephen J., Sheldon, Andrea, Liner David M., “The Impact of Preferred Pharmacy Networks on Federal Medicare Part D Costs,” 2014-2023. Milliman Report, October 2013.